The Castle is about 500 mt. above sea level in the town of Deruta (Perugia) Via della Libertà 2. 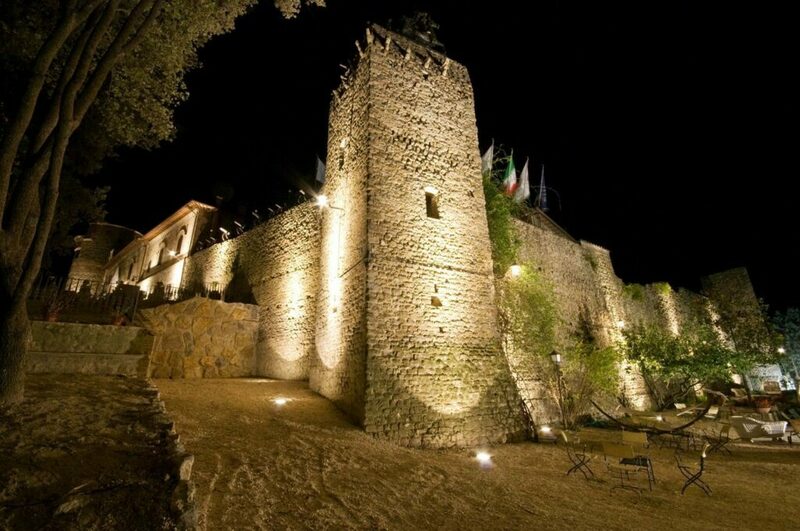 It is reachable from Deruta along the panoramic hilly road called "Via Castelleone" to about 4.5 km. away from the old town. It is a historical monument dating back to XII-XVI-XIX century. 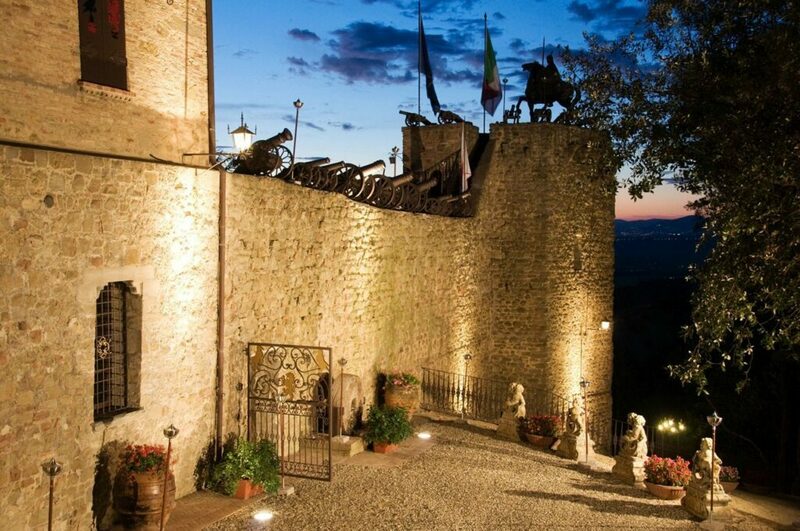 and is placed under the guardianship of the Superintendence for the Artistic, Historical and Architectural of the Umbria Region. The origins of Deruta remain partly obscure. 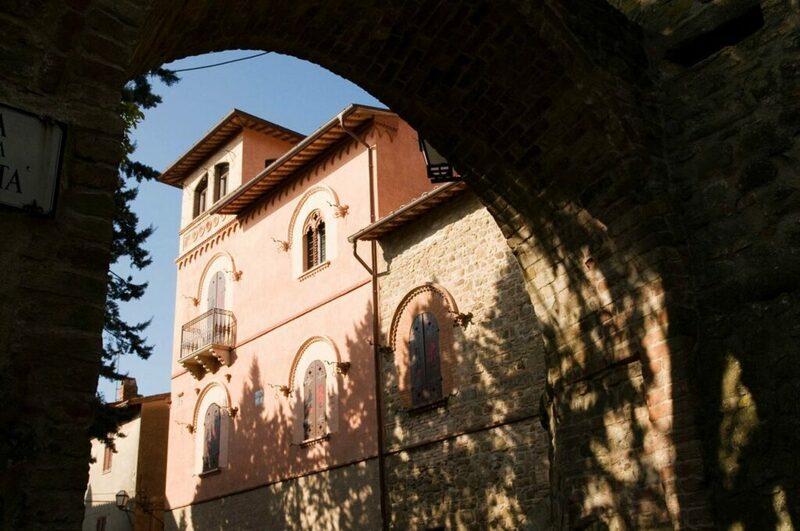 Of certainty are its links to Perugia, which has always been a valid bastion to the south, toward Todi, role that is still clear today because of its fortified castle appearance. Perugia is about 20km far as well as its airport. The Fiumicino airport (Rome) is about 185km far. • Medieval (dating from the twelfth century. ), Detectable in the enclosure made of thick stone (even over 2.5 meters) walls that flow into the great and powerful Longobard Tower (high about 36 mt., Square-shaped and divided into five levels). • Renaissance (from the XV-XVI sec.) 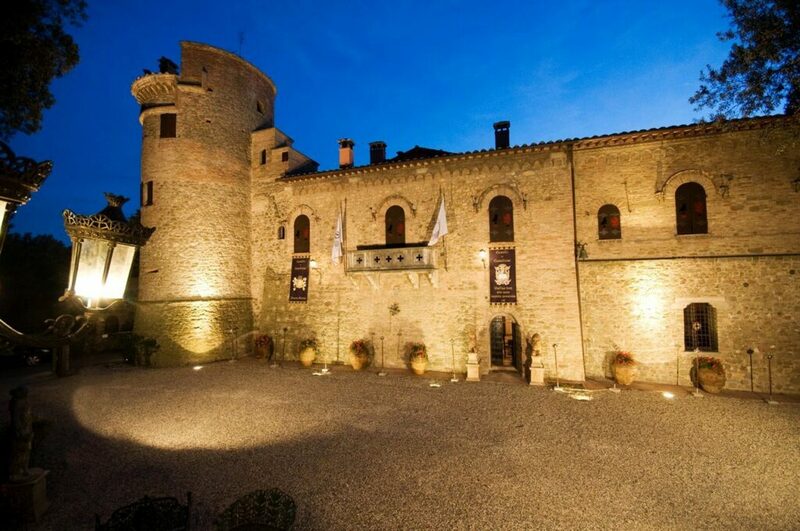 Which constitutes the main body of the castle formed by its main Mastio or Torrione round shape (divided into five levels) and joined to the core of the castle. • Neo-Gothic (dating from the nineteenth century. ), Which represents that part of the building, combined with the Renaissance core, which overlooks the village inside and enclosing at its top the Belvedere Tower. The interior is composed of seven-suite double bedrooms with a third bed, each with spacious bathrooms or salle de bain equipped with the most modern technologies such as whirlpool baths and showers with aroma-therapy, chromo-therapy, ozone therapy, turkish bath and radio. 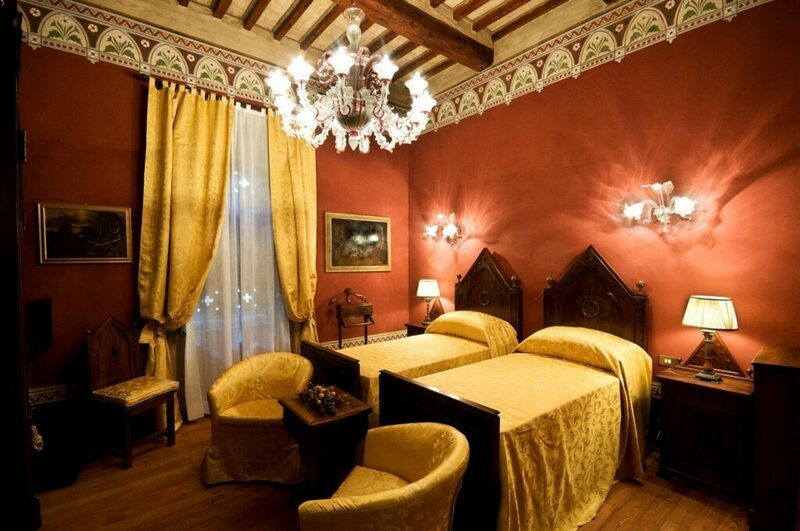 The suites are named Contessa, White Lady, Borgia, Gothic, Virgin, Torre of the Married Couple, Knight. 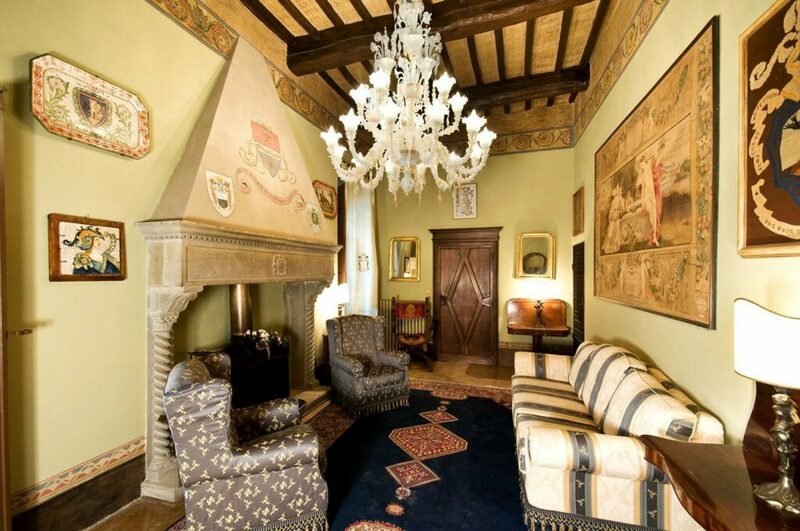 The master apartments on two floors, have 4 double bedrooms with possibility of third bed (each equipped with private bathroom as above) called Bedroom Manor, Bishop's Room, Guest Room, House of the Lady of the Company. In the Lombard Tower are arranged 4 rooms called, Swan, Lion, Raven and Templar Room connected by a spiral staircase. At the first level of Lombard Tower are located 2 equipped bathrooms. 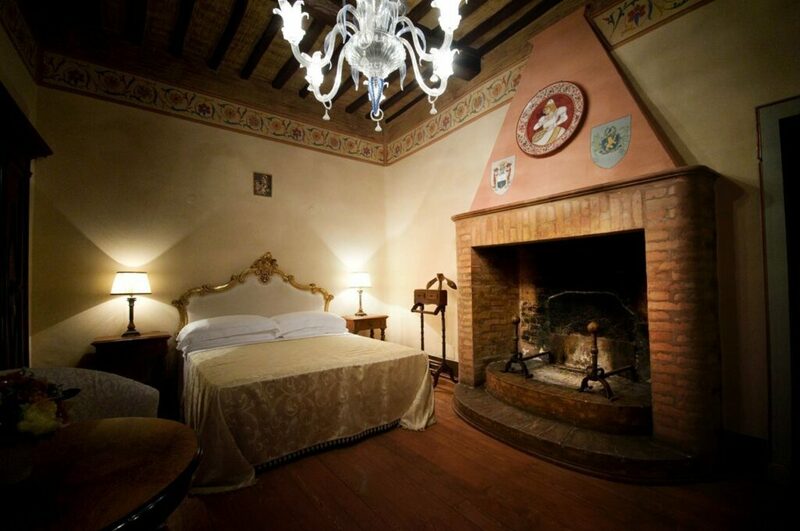 In the Foresteria of the castle there are two bedrooms (one double and one single) with fitted bathroom also for handicap use. 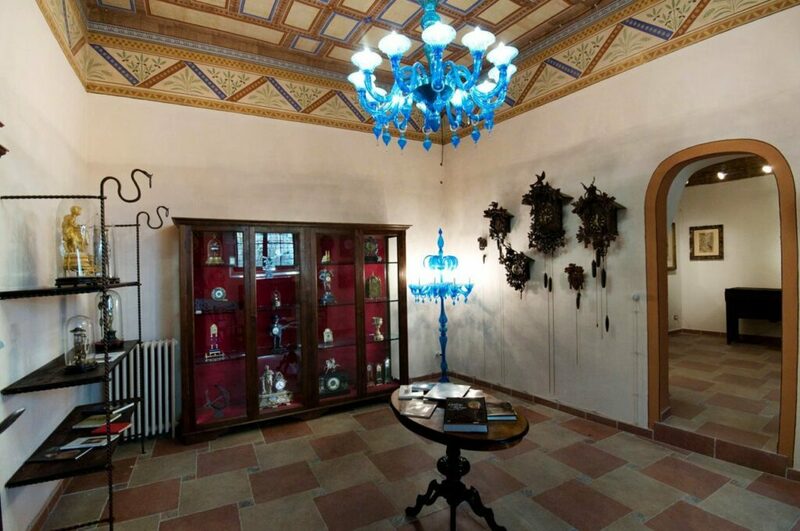 Overall, the bathrooms are eighteen considering the one in the Museum Area service (known as the Grottino), to service the Dining Room, the Cabinet called the Studiolo located in the manor apartments and the service next to the Knights Hall. 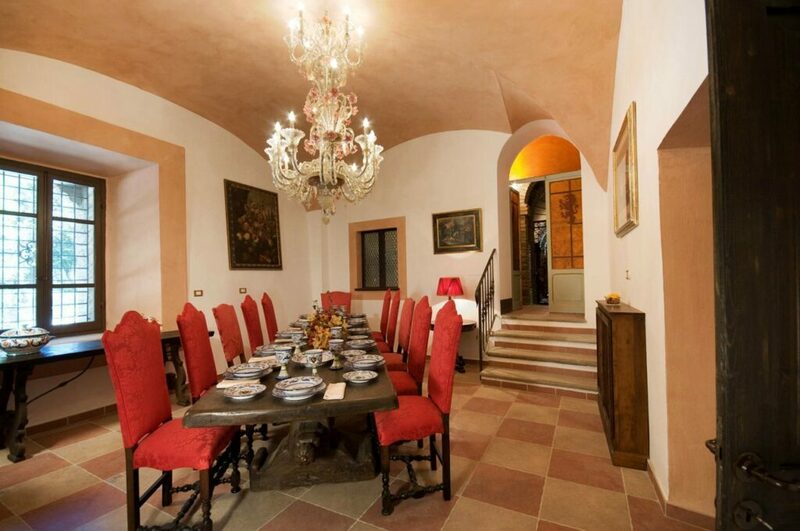 The property has three fully equipped kitchens, the Old Kitchen of the Castle (the ground floor), Kitchen (the manor apartments at the first floor), the kitchen of the small apartment of the lady of the Company (the second floor of the apartments manor). 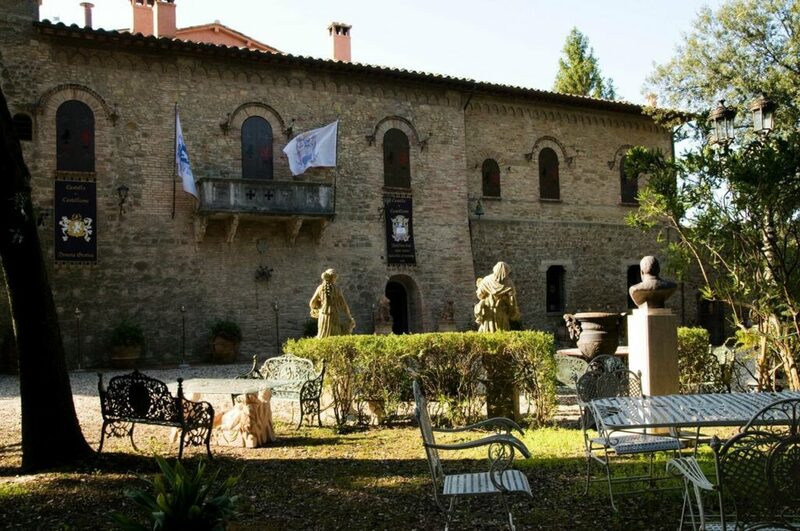 On the ground floor there are several rooms and board rooms of large dimensions as the great Soldier's Room (more than 100 sq m., the biggest of the Castle), the Old Refectory of the Captains, the great entrance on the Borgo, the hall Neo-Gothic painted, the Guard room, the hall of Arms, the Saletta of passage and Grottino, Antica Gallery and main entrance of the castle, the Gallery and Collections room, the Andito entrance to the park with the underlying medieval underground burrows leading Antica Medieval Cisterna, still existing, the Great Renaissance Dining Room, the Old Kitchen of the Castle and the Old Chapel. Connected to the Great Kitchen of the Castle there is a large porch closed by windows leads to two rooms of the Cloister, which in turn bring into communication with the Lombard Tower and its quoted rooms. 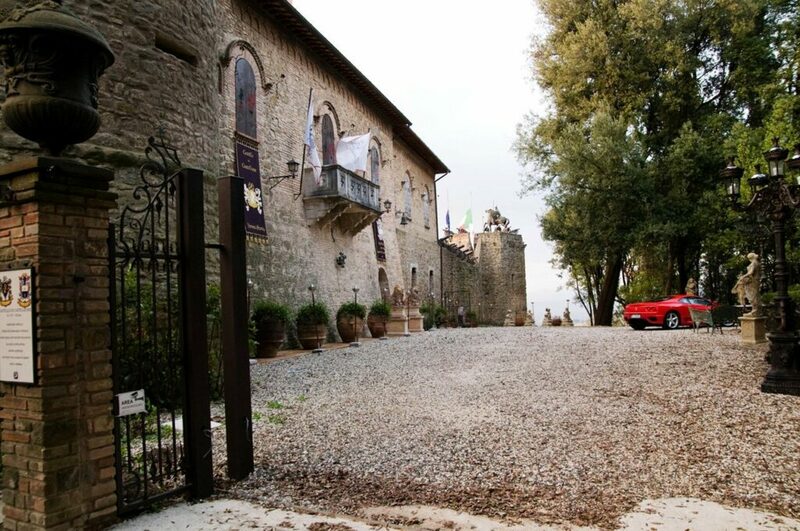 A wide stone staircase leads to the Castle and to the Countess Suite, Borgia, White Lady main floor, Gothic and Virgin. 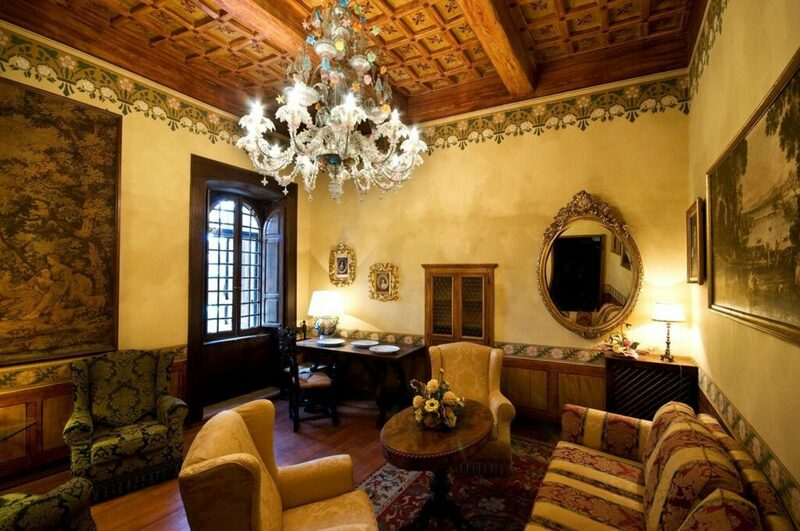 From the Countess and Borgia suites there is access to a large terrace overlooking a square on the Ancient Cloister and the castle courtyard. From the Lombard tower is accessed the external fortification of the castle overlooking the porch. From these a stare carved in stone it puts to discover the top of the Lombard Tower, same that serves as a solarium. On the main floor are also located the Golden Hall, the Old Library, the Office and the Renaissance room where you can enter the main tower of the Newlywed. 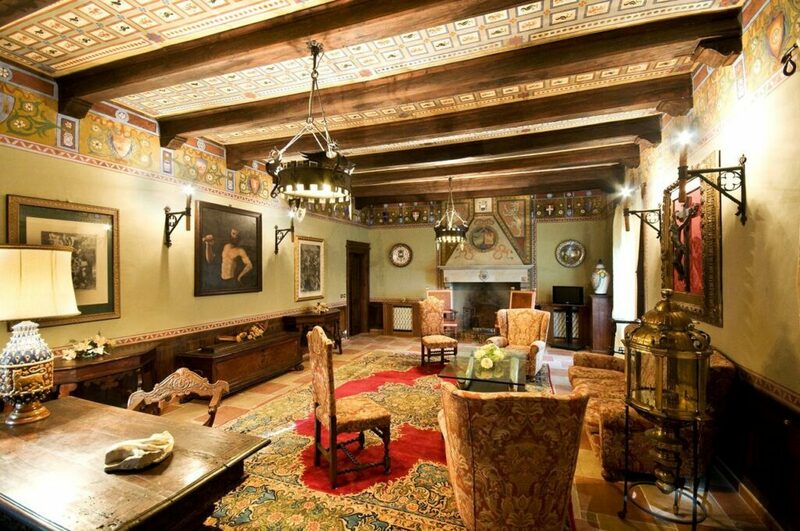 The Mastio of the castle is divided into three levels: La Salle de Bain (entirely frescoed ), the Bridal Lounge and the aforementioned suite of the Tower of the Spouses. 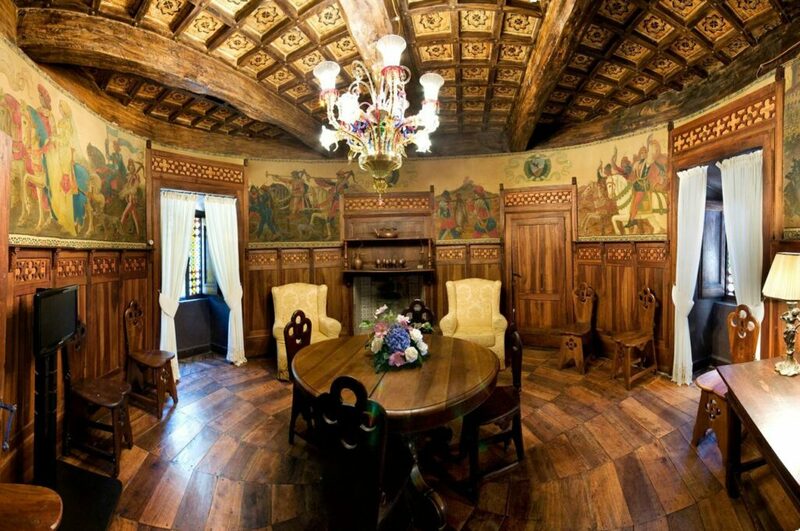 Be noted that all the main floor of the Castle Castelleone, including various connecting corridors, present full wall and ceiling decorations both in tempera fresco with geometric floral motifs, nature, courtly scenes, scenes of feudal militaristic environment, etc., always different in every environment. From the main floor leads to the mentioned of the Knight and the Great Hall of the Knights also entirely decorated in tempera is the ceiling to the walls. From this large a covered outdoor staircase representative room puts the top part covered the Belvedere Tower which offers a 360 degree panorama. The total perimeter of the Property is approximately 800 meters. including three roads. 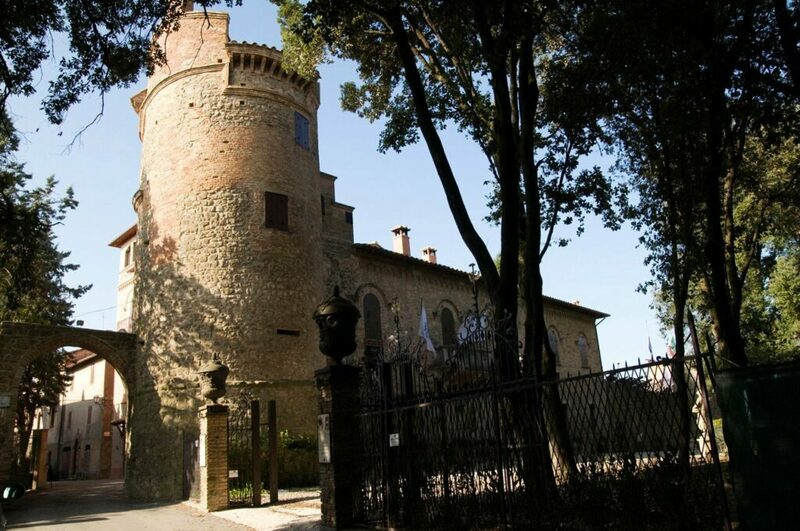 The Castle is served by nine accesses of which three from the Park (with large wrought iron gates and automated cusps), one from the courtyard, one directly placed on the property by the main facade Park, three from the inside Borgo Via della Libertà and one on Olive Tree lane. The relevance of land surrounding it is about 8500sqm , mainly planted with tall trees almost all secular (oaks) and park and terraces. The pool of mt. 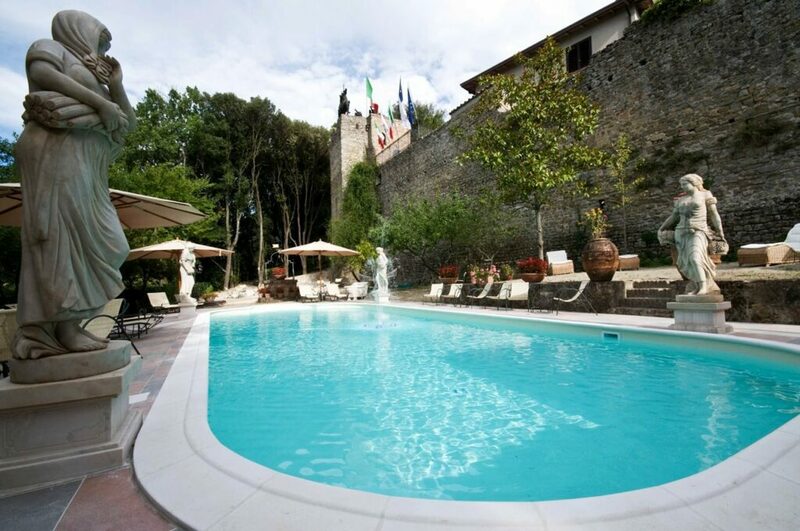 12.5 x 6 positioned at the foot of the castle walls with whirlpool bath of 8sqm of Jacuzzi with aroma and color therapy. Adjacent to the pool is a stone and bricks well. 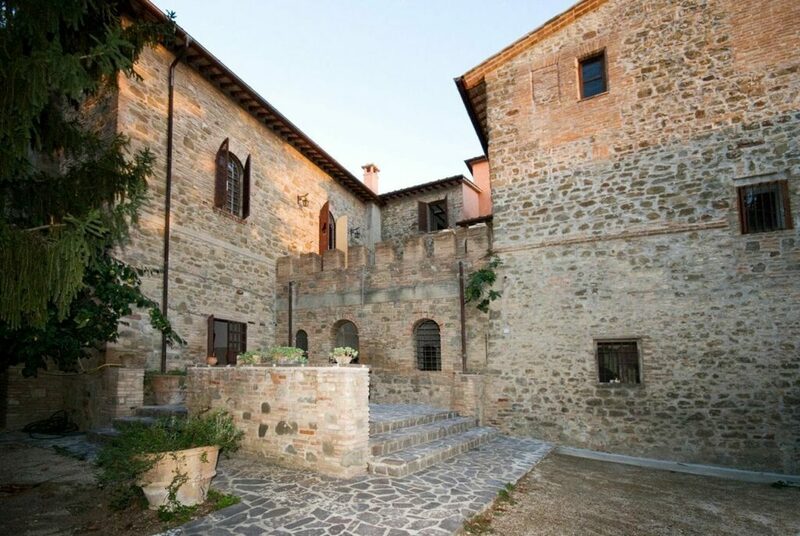 The property, consisting primarily of stone walls, ancient facing bricks and plastered parts, covers an inner surface of over 2000sqm (more than 500sqm of attic) developed in almost 100 rooms. The internal cloister is enclosed in part of the building facing north-west with the center another still working well-cistern made of stone and bricks. 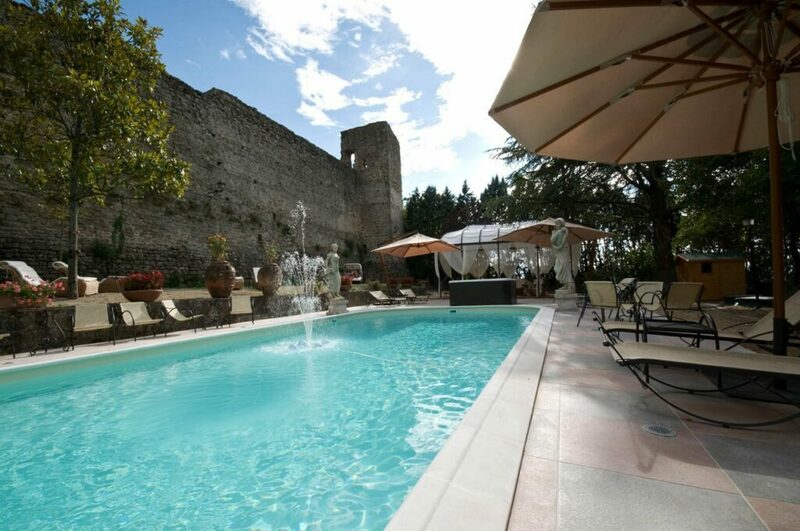 This prestigious castle is perfectly adapted to be used as accommodation "de charme" of the highest level. 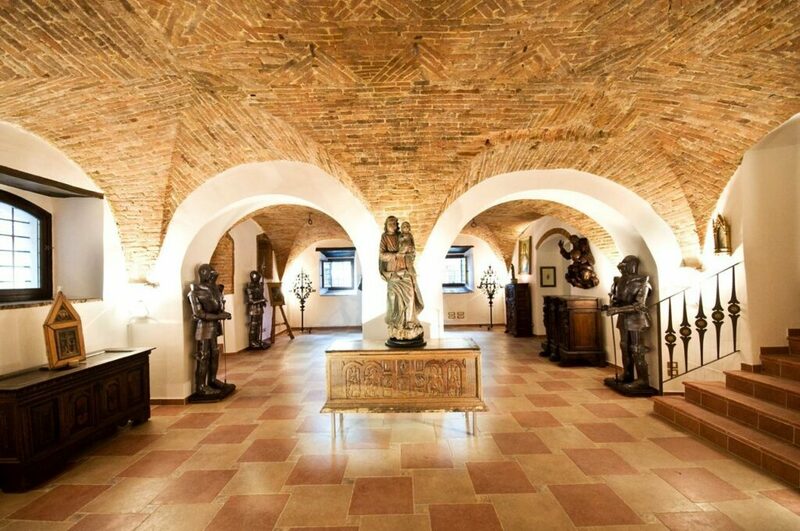 Forming an investment devoted to beauty, art and history.